Etkileşim (Interaction) is the Academic Journal of Üsküdar University, Faculty of Communication. The journal is a peer-reviewed, bilingual publication accepting articles in Turkish and English. 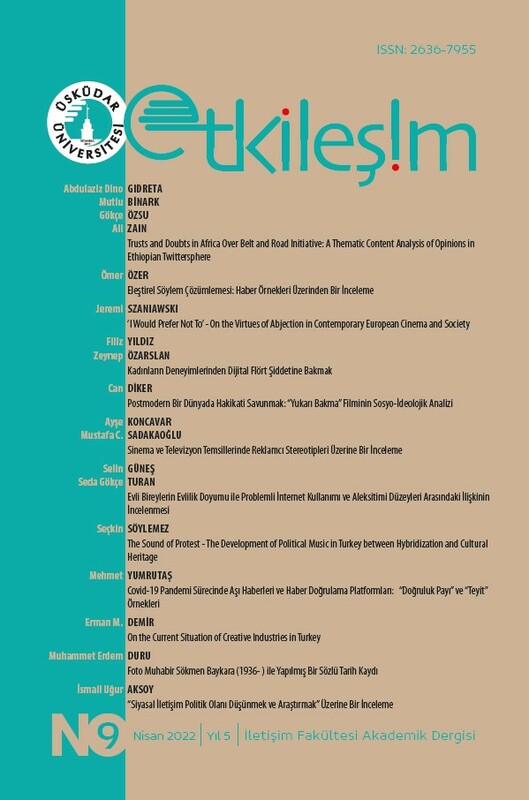 Etkileşim is published biannually in April-October, available both in printed and on-line versions. Etkileşim aims to contribute to national and international-level academic interaction through conveying original studies/articles concentrating on communication research, theory and practice as well as intersections with other social and natural sciences. Etkileşim consists of two parts. First and the main part includes peer-reviewed scientific articles. The second part includes non-peer reviewed academic studies such as article translations, book reviews and essays. Below is the guideline of Etkileşim, the Academic Journal of Üsküdar University, Faculty of Communication. In Etkileşim, opinions, thesis and claims belong to authors and no one can be held responsible. Any submission must be the original work of the author; has not been published previously, as a whole or in part, either in any kind of medium, printed or electronically, or is soon to be so published. The works previously submitted in national or international scientific meetings, congresses, conferences, or symposiums can be accepted and included in the referee process if they are transformed into the article format. The author(s) must mention where the conference submission was presented in the footnotes. Articles may be reproduced for educational purposes only. Apart from educational purposes; figures, graphs and tables cannot be reproduced or archived partly or wholly without permission. The authors sign a document showing they agree that authors will not receive any royalties from Üsküdar University for any manuscript. Uskudar University does not charge any submission or publication fees.